• Reach out to prospective customers using this postcard with business card magnet attached. Postcard with business card magnet is a great way to contact a potential target market as it guarantees a glance compared to regular mail. • Imprint your logo, text, and artwork using our full, four color printing process on both the postcard and the business card magnet. 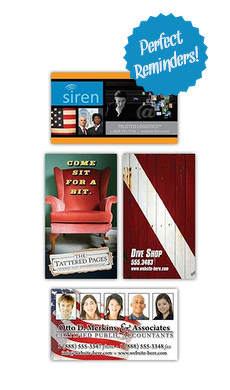 • Designed for 8.5" x 5.25" postcards and includes a 3.5" x 4" magnetic business card that is spot glued to the surface. VALUE ADDED SERVICE: Have us address from your data base and mail from our mail room for just the cost of postage. First Class Rate: $.433 (typical delivery time = 1-5 days). Standard Rate: $.29 (typical delivery time = 10 days). Non-Profit Rate: $0.202 (typical delivery time = 10 days).